The ST-A1 (also known by STA-1) is a Rank IV Japanese medium tank with a battle rating of 6.3 (AB/RB/SB). 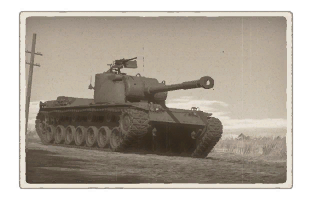 It was introduced along with the initial Japanese Ground Forces tree in Update 1.65 "Way of the Samurai". The ST-A1, similar to most Japanese tanks, is lightly armoured. Although the sloped upper glacis and the rounded turret are capable of bouncing off the occasional shot at BR 6.3, most enemies it faces will not have any problems in penetrating the armour. Combined with the tight placement of crew, modules, and ammo, the ST-A1 is easily taken out in a single shot. The ST-A1 can serve as a sniper or flanker (although it does not have the best speed), however, full utilization of the terrain is essential for survival - due to its powerful gun and low profile, the tank is able to fire off long-range shots without exposing itself. The excellent reverse speed should also be taken advantage of to quickly retreat into cover. The STA1 bears the common Japanese post-war camouflage-schemes - green, bi-color green and the white spotted winter camouflage, as well as the beige-gray-green and multi-color camouflage patterns that are purchasable with Golden Eagles. 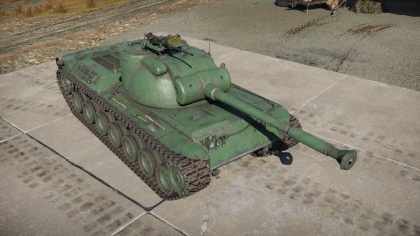 The tank has a distinct silhouette with its rounded turret and long, low chassis, and carries the 90 mm M3A1 cannon found on the M46 Patton tank. 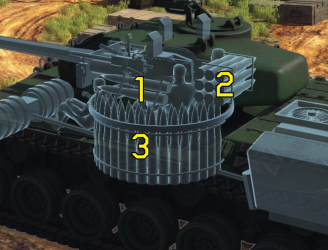 When facing the ST-A1, the left side of the turret holds the gunner and commander, the right side holds ammo, so a well placed shot into the turret will result in a catastrophic explosion, or, at the least, double crew knock out with solid shot. If unable to shoot the Gunner out, the Breach which is the largest thing in the turret will do as the repair is close to 1 minute (or less depending on crew) giving enough time to reload and finish off the tank. Ammo racks of the ST-A1. Stay out of sight and find a good, defensible spot on the map and use the gun (preferably the HEAT-FS with 305 mm penetration) and excellent optical zoom. The tank has almost no armour, so do not rush forward - stay behind allies. Take a shot, then use the reverse speed to retreat to cover. This page was last edited on 26 March 2019, at 15:07.